December is not the time to loose your baking focus. As I have said before I have spent months preparing for this four-week festival of butter and brown sugar. The holi-daze are also not the time to be shy when it comes to over-the-top baking so let’s save the two ingredient slushies for summer when turning on the oven requires a ridiculous amount of effort/some sort of bribe. If you can believe it these started out as cinnamon rolls but then I went bonkers and ended up with this recipe which is further proof I can not leave well enough alone when it comes to the baking category. But most recipes need a good switch up every now and again. Think of these as those orange chocolates that you smash up against the wall to break them into individual slices BUT in the form of a cinnamon roll’s cousin. 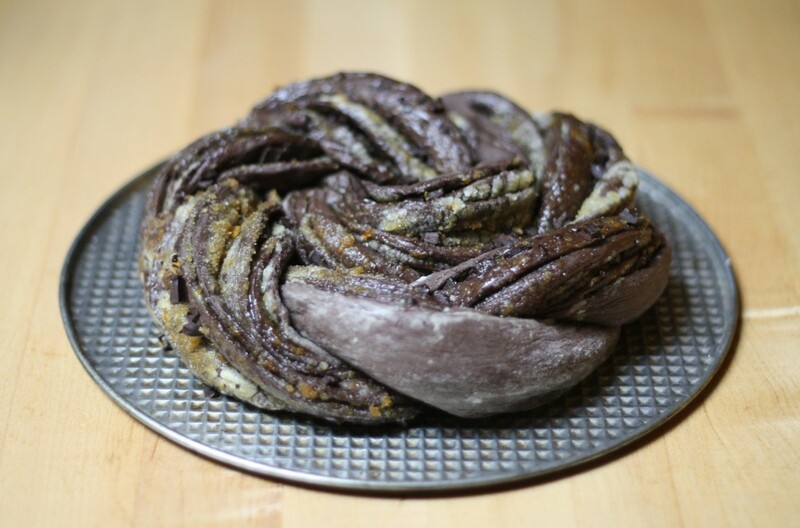 The twisted swirl shape looks impressive for not much extra effort and I urge you to give it a-go but just in case, I have included directions for making these as good-ol’ fashioned swirl buns as well. 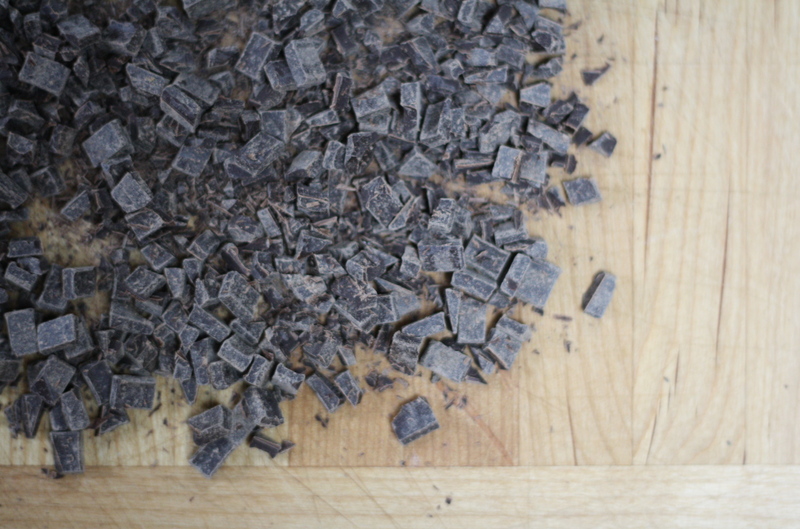 It all begins with a yeasted chocolate dough. Look at that thing of beauty! 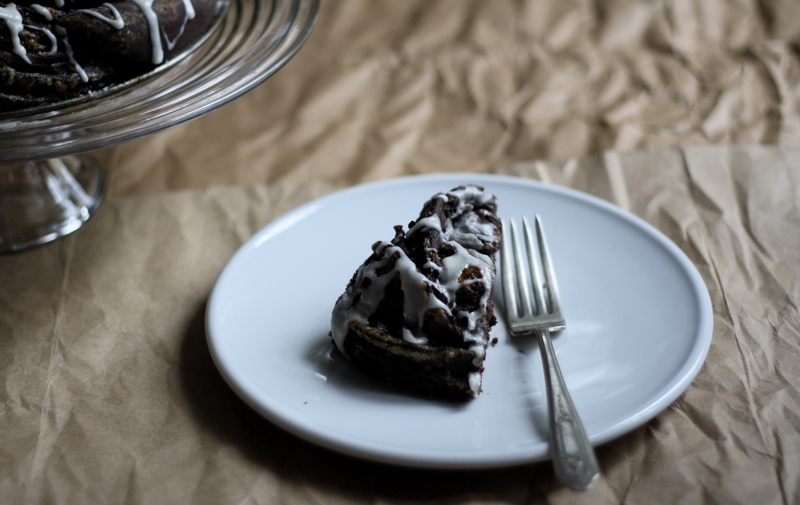 Why have I not added cocoa to every batch of cinnamon roll dough before? I apologize for not thinking of this sooner my friends. I also let my dough rise in the refrigerator overnight which makes everything easier. No one likes to wait for dough to rise, so it’s best to do it while you are doing something productive like sleeping. 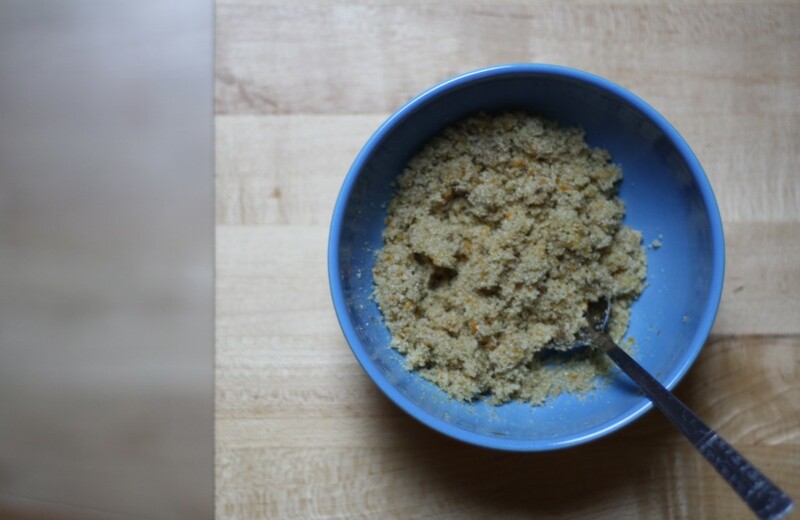 The filling is a mix of granulated and brown sugar and orange zest. Zest keeps everything, um, extra zesty and cool. Next chop up some good quality dark chocolate (looking much prettier in an ombré color scheme). Once all the filling ingredients are ready. Get your roll-OUT on. Roll out the dough and brush with melted butter. This feels like cinnamon roll making, right? No reason to be scared. It’s just swirl buns of the chocolate and orange variety. Now is the time to get your roll-UP on. Roll it up! At this point you can slice the log into swirl buns or you can get really jazzy and cut it down the middle and make twisted swirl bread. You just need to decide how fancy you want to get. I would recommend going all the way since on the scale of one to fancy, this is James Bond in a tux drinking a martini. Helpful hints for the fancy route include: sharp scissors and a few deep breaths. See that wasn’t that hard. How cute is this? On the scale on one to cute, I’d say this twisted ball of cocoa dough is off the charts! After a second rise, the bread gets baked. 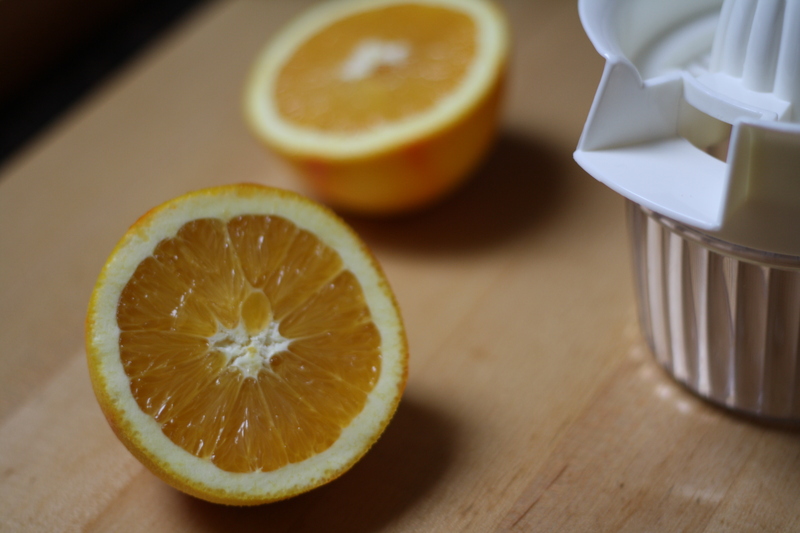 While you are waiting, you might as well whip up a super simple orange glaze. Powdered sugar, freshly squeezed orange juice and a pinch of salt are all you need to take this bread to the next level. I wish Smell-O-Vision was a real thing so I could share the aromas of orange zest, dark chocolate and cocoa bread all melting together. But when you take this pan out of your own oven, this will be the point at which you are confident that it was all worth it. The final touch is to drizzle the orange glaze and forth over the top of the bread and devour immediately. P.S. Can someone get on inventing that already? Thanks. The internet would become a much more magical place if I could experience at least a few indirect benefits from the amount of chocolate chip cookies that I see on my computer screen everyday. For seeming rather indulgent this bread is actually not over-the-top sweet. Dark chocolate and orange balance together perfectly for an updated twist on a classic holiday-time brunch staple or afternoon tea treat. 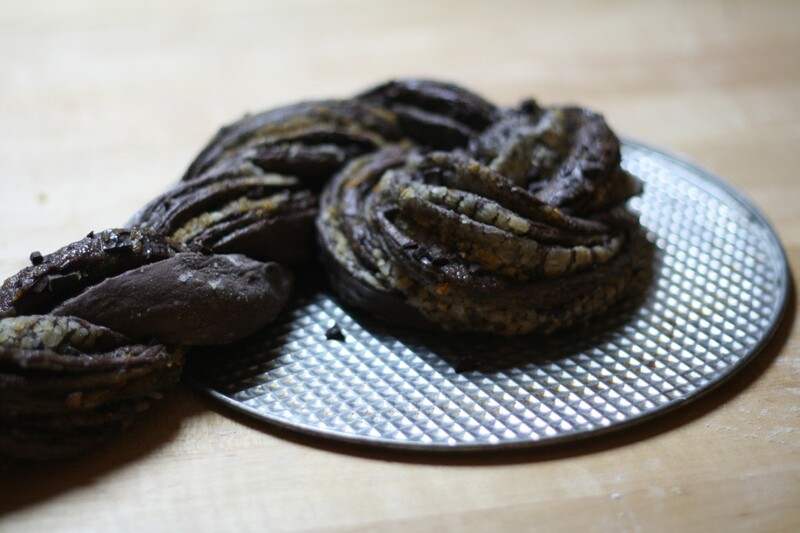 The orange zest is mild but distinctly present and the bits of dark chocolate chunks melt into the layers of chocolate bread for pockets of rich flavor. Happy holiday baking my friends! Make the dough: First proof the yeast. Fill a small bowl with the warm water and gently stir in the yeast and 1/2 teaspoon of sugar. Let stand untouched for about 5 minutes or until the yeast is foamy and bubbly. This step is important because it makes sure that your yeast is alive (and thus will rise) so if your yeast does not do this then try again with another package of yeast. Dig out your hand mixer and have it at the ready. In the bottom of a large bowl (the bigger the better!) whisk together the melted butter and milk then add in the remaining 1/4 cup sugar, egg, and salt and whisk until smooth. Add in the cocoa and proofed yeast and whisk until combined. Add about 1/2 cup of flour and beat on medium low speed until the flour is combined. With the beaters running on medium speed, keep adding flour about a half a cup at a time, until the dough starts to pull away from the sides of the bowl. You may need a little more or less flour but you want the dough to hold together in a ball and be just a tad sticky. Transfer dough to a lightly floured surface and knead for several minutes until smooth and you have a nice and round little ball of beauty. Transfer dough to an oiled bowl and turn to coat. Cover with plastic and a clean tea towel, and let rise for about 2 hours or until the dough has doubled. 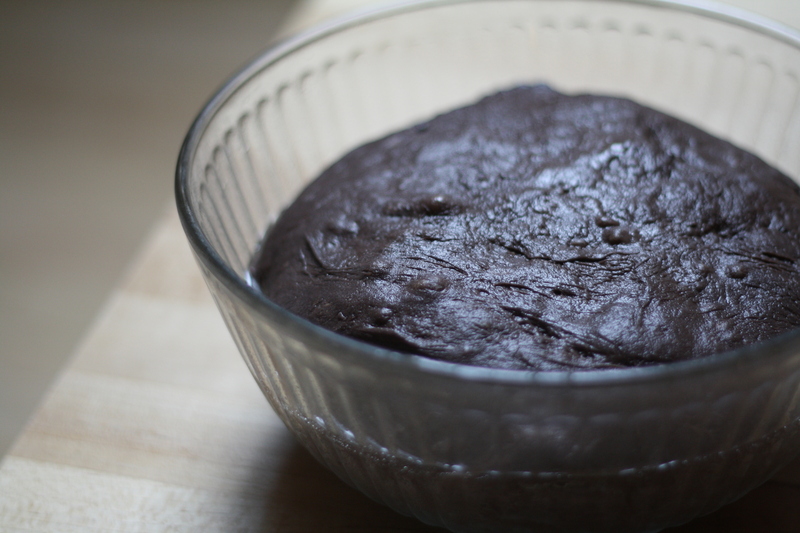 Alternatively, you can cover the bowl with plastic and let the dough rise overnight in the fridge (and up to 12 hours). Prepare for baking: First make the filling by rubbing the orange zest into the sugars with the back of spoon until combined. 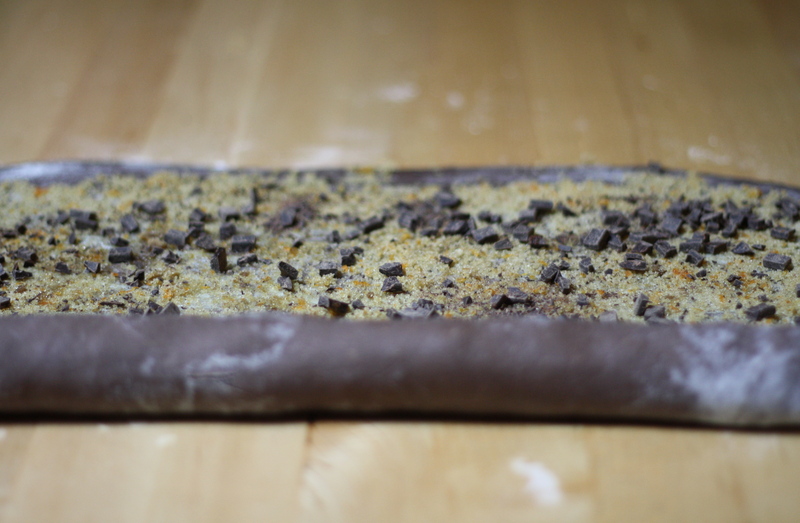 On a lightly floured surface roll out the dough into roughly a 12 inch x 16 inch rectangle. Brush the top evenly with melted butter and sprinkle the orange sugar over the top followed by the finely chopped chocolate. 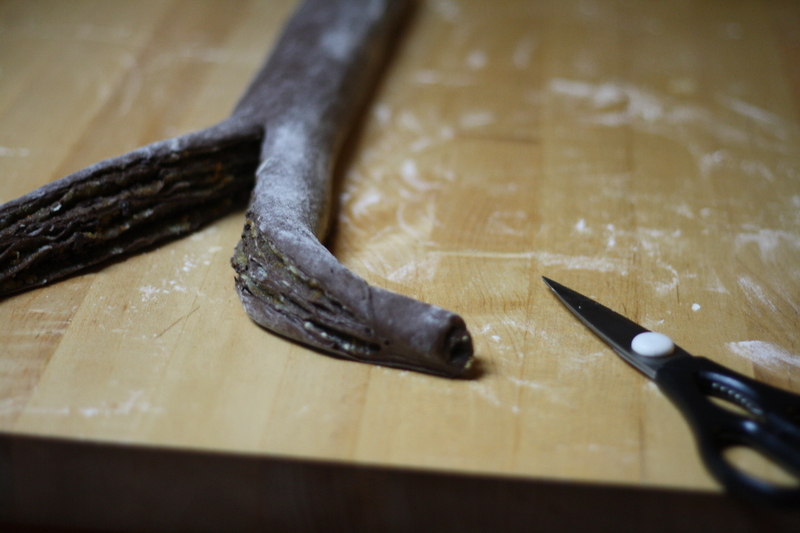 Starting with the longer side, roll into a log, gently pinching the seam to keep it rolled up. 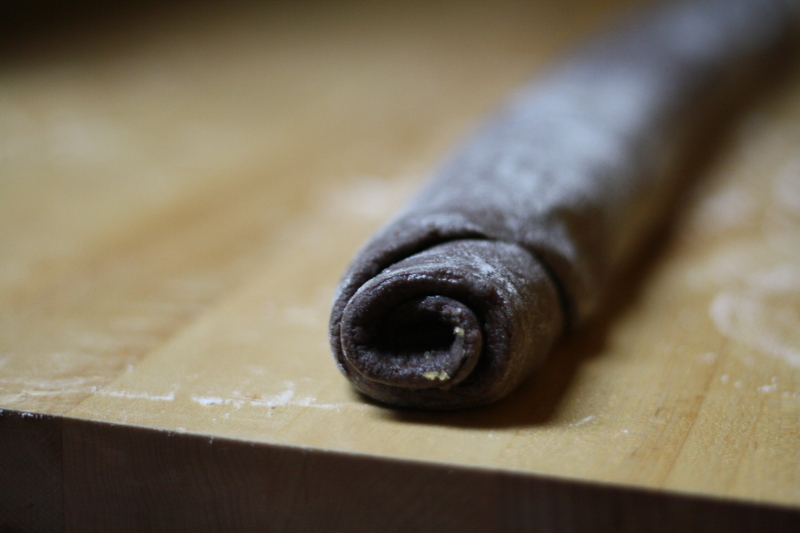 To make swirl buns: Cut the dough crosswise into 16 equal pieces (or about 1/2-inch wide slices). Transfer the buns to a buttered 9×13 pan, cover loosely with plastic and let them rise again for 30 to 45 minutes. 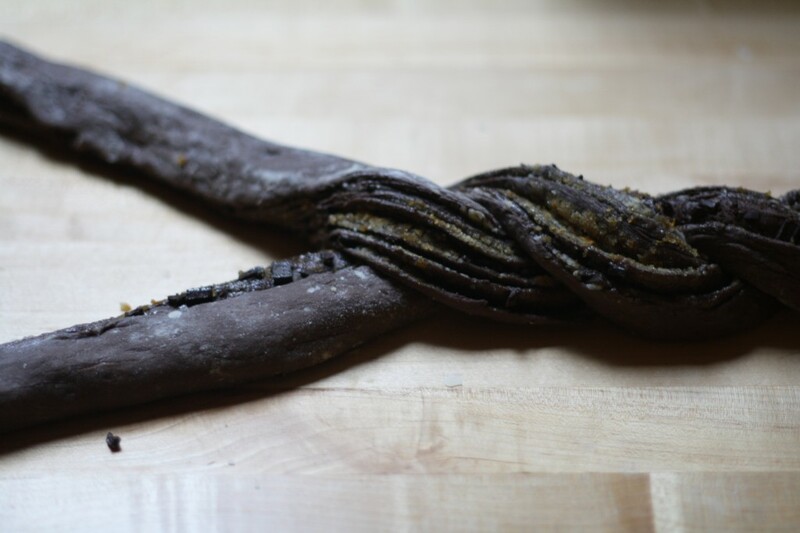 To make twisted bread: Cut down the middle of the log with sharp kitchen shears and roll each half up to expose the middle. You will have two long pieces of dough with the filling facing upwards. Now take a deep breath. Once you get started, the twisting goes fast and isn’t as scary as it seems. The layers will want to open up – but don’t let them! – and just keep guiding them in place together as you twist. Pinch the two pieces together at the top to join them and then fold one side over the other and continue alternating each side back and forth until you have twisted them into a single piece. Remove and lightly butter the bottom of a 9-inch springform pan. Carefully place one end of the twisted log into the middle of the base and roll the log up around itself then gently tuck the end under. Place the ring of the springform over the base and snap it in place. Cover loosely with plastic and let rise again for 30 to 45 minutes. While the dough is on its second rise, preheat the oven to 350. 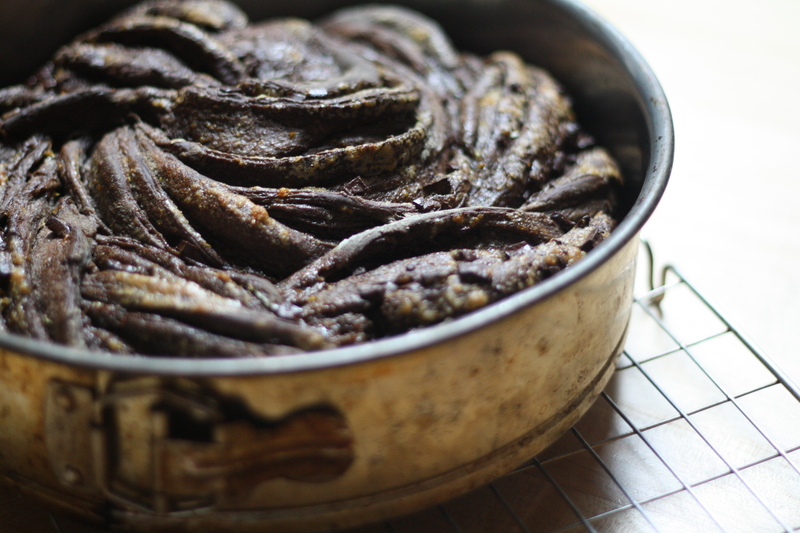 Bake the twisted bread for 40 to 45 minutes or until the filling is bubbling and the bread is cooked through. 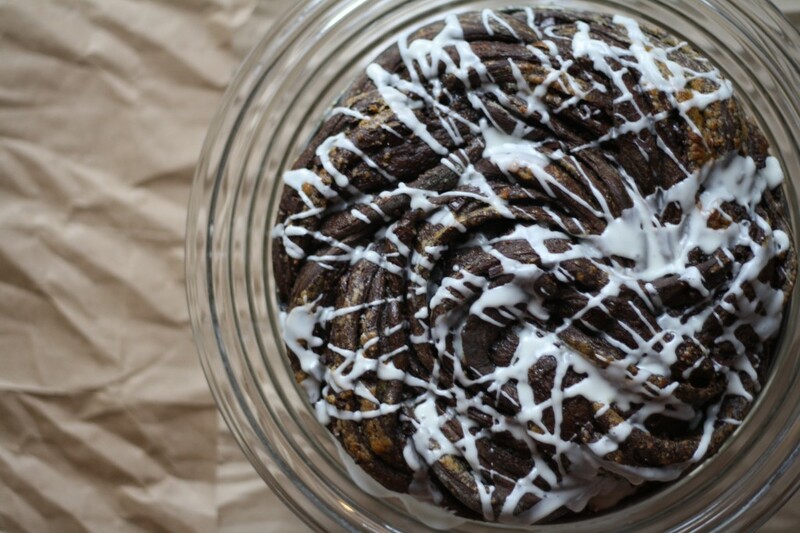 If you went the swirl bun route then bake for about 20 to 25 minutes. Add the finishing touches: Prepare the glaze while the bread bakes. Measure the powdered sugar into a small bowl, add a pinch of salt, and stir in the orange juice one tablespoon at a time until the glaze is smooth and spreadable (I used about 2 tablespoons). Remove the bread (or buns) from oven and let cool slightly on a wire rack. Unmold the bread, transfer to a fancy serving platter and drizzle the glaze evenly over the top. For buns, just drizzle the glaze right over them in the pan. Bread (and buns) are best served warm. woweee this recipe is intriguing! totally impressed. want to make! This is a beautiful looking piece of baking. Perfect to bring along as a gift! Or eat entirely on your own. Either way. Lillie this bread is gorgeous! No way I can pass up this recipe and trying the “simple” twist technique. However, I need to think in terms of slight flavor variation. My family doesn’t like (thought I love) the orange chocolate combo. 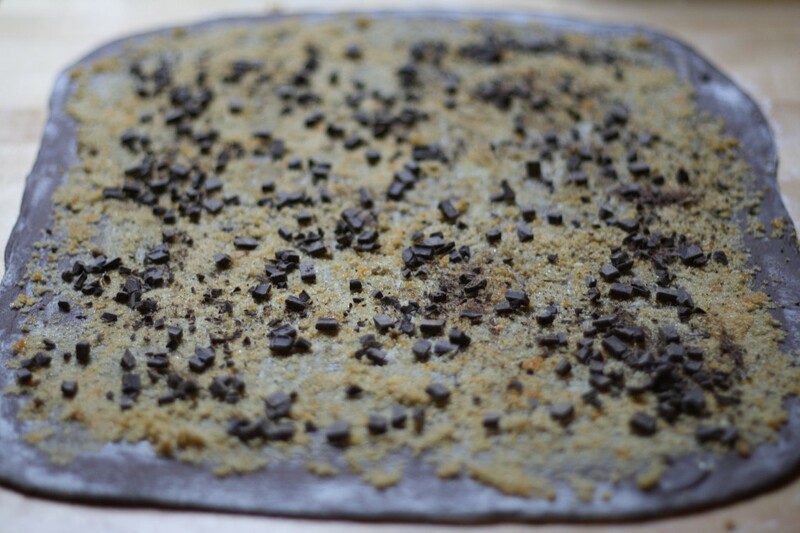 How about subbing toffee bits for the zest in the filling and maybe a slightly caramel type brown sugar glaze? What do you think? I think that sounds like an amazing idea and I’d love to know how your version turns out!! This is so gorgeous I can’t take my eyes off it! I totally want to try this technique! Such a beautiful, creative, hilarious post! Thanks for brightening my day. Wow – I just ordered cocoa from King Arthur I may need to make this. It looks/sounds amazing. i could drown myself on that bowl, and i would die happy! As a novice baker – a question. Once you have proofed the yeast in the bowl of warm water, what do you do with it? I looked through the recipe three times and I see no mention of yeast after proofing. It would make sense that it has to go in the mix with the flour at some point, otherwise the dough would not rise. Can you explain when/where the yeast gets added a little more precisely? Thanks, and Happy Holidays! Hi Pat! I did indeed forget to mention that very important step! 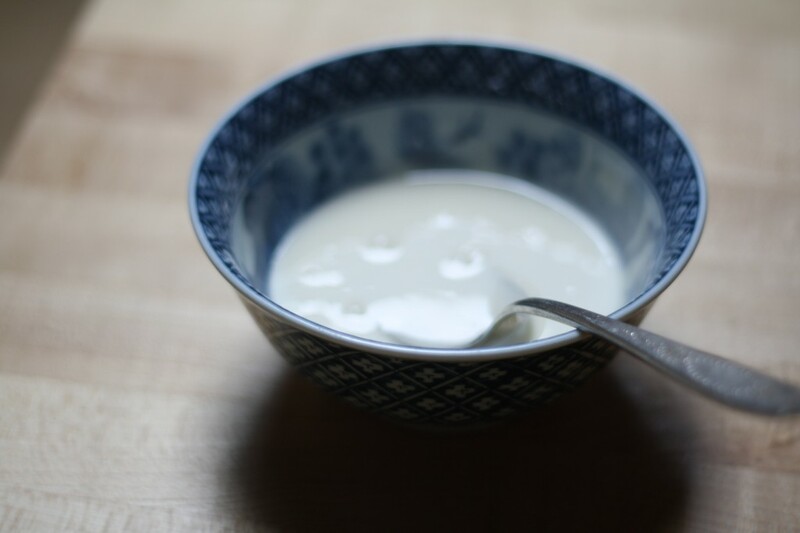 The proofed yeast is whisked in with the milk and melted butter at the beginning. I will update the recipe and thank you for the catch. Happy holiday baking! I made this amazing bread last night. To say it was great is an understatement! I only wish I had saved the recipe for when more people would be around. First, because more people would have seen its beauty and been terrribly impressed Second, maybe I wouldn’t have eaten quite so much This recipe is definately being filed under delicious and impressive to be baked again and again. Thank you! I am so happy to hear that it was a success! Here is to more happy baking in 2013!! I love baking and especially like yeast dough because you can make so many things with it. The double chocolate is such a brilliant idea, I definitely embrace it! 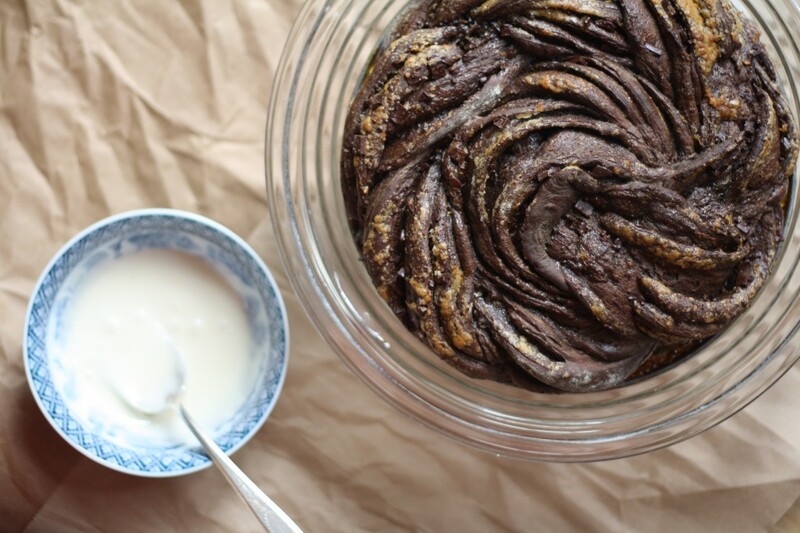 I made a couple of tiny changes to your recipe – my family doesn’t like the orange and chocolate combination(unfortunately for me) so I put a little ground cinnamon in the filing instead. I combined the filling ingredients and created a paste and that was easier to manage when cutting and twisting. This was a huge success, thank you! Hi Lilu! I am so happy to hear that it was a baking success! And cinnamon sounds like a lovely addition to this recipe! this looks so delicious. It will be my next challenge! The chocolate- orange combination is ever so yummy. Thanks for this phenomenal recipe!